Well, it has been about a week since I gave a decent entry. Not that having you vote for my sister is not decent. haha. Thank you to all that voted BTW! This last week has been pretty good. I cannot even 100% remember everything that we have done. Lets start with Friday. My dad decided to go to Florida for 5 days for his yearly trip. He wasn’t going to go this year because he feels he could spend a lot of time working on the house (he is still in the process of finishing the bathroom upstairs). In the end, he couldn’t resist. He spends his time down there visiting various family members that have homes (mostly my mom’s side) & spending one night on his own near the ocean. So, Friday he left bright and early & from what we hear, he is having a great time. My mom and I decided to go to the Mall of America to walk around the floors. We figured that walking the mall would be close to the idea of walking outside. It was nice to see what stores have changed since we worked there. I would say that about 50% of them are new. Crazy! Since my dad is gone, I have a little bit more responsibililty….so it was back home for us. Saturday we woke up to more snow. Nothing new around here. Jenna and Ross came over in the afternoon to help entertain us & Ross shoveled our sidewalk & driveway. Thank you Ross! I love having a brother-in-law we can rely on to help us out! Today my sister, mom & I spent the day shopping. What can be better than that? We started at Home Goods (which was packed). That is a store that really puts my wheelchair driving skills to good use. Whenever I hear somebody break something in that store, I get scared that it was us. But so far it hasn’t been !!! 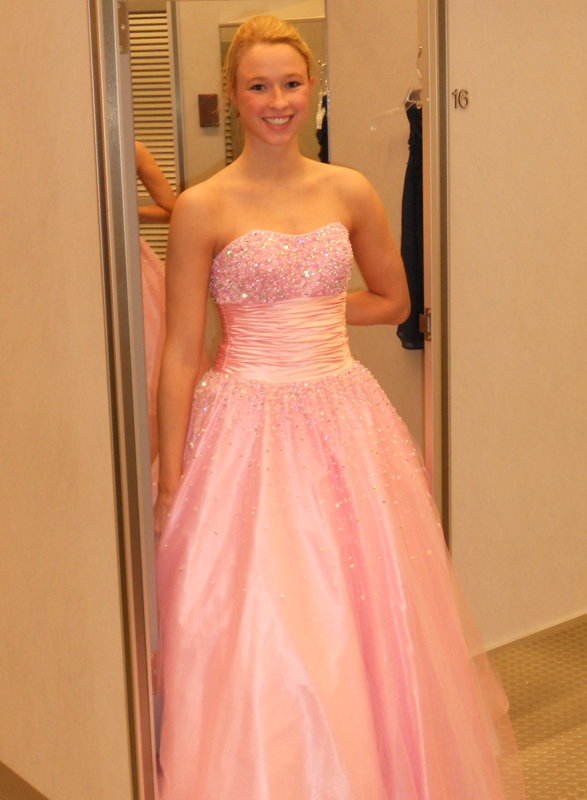 Next it was off to the mall where Jenna couldn’t resist trying on a prom dress. She was drawn to the pink & sparkles as usual. Overall, it has been a wonderful weekend & my mom is in great spirits even though her man is gone. That is about it for now. For those of you that wonder, my mom does get a little sad when my dad leaves town. It is very bitter-sweet because my mom used to always travel to FL with my dad every year. Her dad lives down there….and we have so many wonderful family memories in Florida. My mom is extremely supportive (as we all are) that my dad get a break. We will always wish that we could take a family vacation together, but that is one of the challenges my family will always face. I am proud of my mom for being so supportive & understanding. She will forever have the short end of the stick in the vacation regard…..and I am so thankful for how encouraging she is that we all get the breaks we need. My mom rocks! Prayer for Julie: Pray for continued “good health”. She seems to be doing excellent with energy & immunity these days! Lets keep it going!